Attendees at the launch of the South Island Historic Survey maps website held at Environment Canterbury. 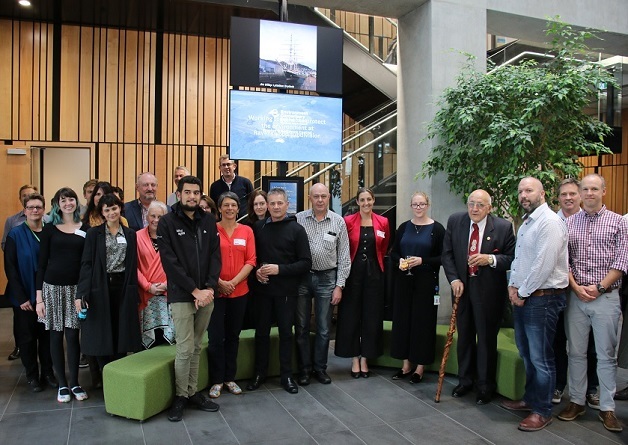 A joint project between Te Rūnanga o Ngāi Tahu, Archives New Zealand, Land Information New Zealand, and Environment Canterbury is bringing the original survey plans of Canterbury to life on a new digital platform. During the European settlement of Canterbury in the 19th Century, land was surveyed for the legal purchase and sale of land parcels. The survey maps produced by the early surveyors documented a pre-European landscape revealing watercourses, forgotten travel routes, place names and settlements. The whereabouts of the old waterways led to Ngāi Tahu approaching Archives New Zealand in 2012 for the ‘Black Maps’, as they are commonly known, to be used in the Ngāi Tahu Cultural Mapping Project. Given the fragile nature of the maps, it was agreed to photograph the smaller survey maps, until a methodology could be developed for the much larger and fragile roll plans. “Unlike the smaller plans, the larger roll plans can be up to 10 metres long. The maps have had a hard working life and continued handling presents a risk of further deterioration in their condition. Combined with their fragile nature, they cannot be easily digitised,” said Chris Adam, Regional Archivist at Archives New Zealand’s Christchurch Office. The NZMS relocatable Large Format Copy Station, developed specifically for very large format items such as the Black Maps. Archives New Zealand and New Zealand Micrographics Services Ltd (NZMS) then worked together to find a solution to photograph the larger roll plans. A purpose built rig was developed that allows a camera to capture images as the maps pass beneath it under a glass platen. The maps are progressively moved and unrolled under the camera. The images are then stitched together to create one file. “This has been a technically challenging project which is unique at a global level, in terms of the scale and condition of the maps and the quantities. It has been a great experience to work on such a project, particularly with the level of collaboration between all parties and we are delighted to see the output delivering amazing results for everyone,” said NZMS General Manager Gavin Mitchell. Once the process is completed, the survey maps are made publicly available through the Archives New Zealand online finding tool, Archway. LINZ has so far been the biggest financial contributor, and, as the direct descendant of the offices that created the maps, has a keen interest in ensuring their preservation and use. 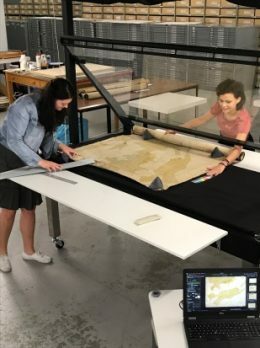 “Digitising these survey maps not only preserves New Zealand’s valuable historic record for future generations, it makes these maps electronically available to LINZ’s current customers who still need and access this material,” said Clare Singh from Land Information New Zealand. An exciting initiative of the project is the digital tracing of the natural features on the ‘Black Maps’. Led by Environment Canterbury, a GIS layer of the old waterways, vegetation, and other landscape features is being developed. This image shows the different landscape features surrounding Wainono Lagoon in the 19th century as per the historic South Island survey maps. Although the project is focused on Canterbury, Ngāi Tahu proposes to extend the project throughout the rest of Te Waipounamu. 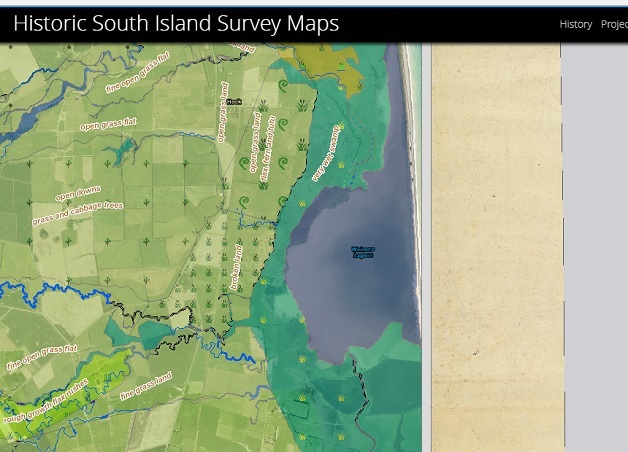 “The survey maps are a wonderful resource that provide an insight into the landscape that Ngāi Tahu experienced prior to European settlement,” said Ngāi Tahu Archive Manager Takerei Norton.